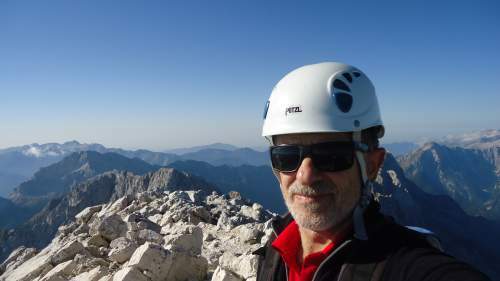 Climbing Jalovec in the Slovenian Alps has been my desire for several decades, so finally I did it this year from the Vrsic Pass. Here is my report about this great mountain. Jalovec as seen from the south slopes of Prisojnik. In 1991, I was passing through the Soca (Soča) Valley with my family on our way from Trieste, and we spent a night in a hut at Vrsic Pass. So this was a chance to see the mountain for the first time, and this from its south side. But I knew about it from earlier. There is a book (in Serbian only) with the title ‘Ka visinama i ćutanju’ (roughly translated as ‘Towards heights and silence’) by Rasko Dimitrijevic (Raško Dimitrijević), a university professor from Belgrade and a true alpinist who climbed all those majestic Slovenian mountains together with Joza Cop (Joža Čop) the famous Slovenian climber. This was in the time between the WWI and WWII when Slovenia was the part of the Kingdom of Yugoslavia. The book is about mountains in general but the main part is about their climb to Jalovec from Tamar Valley. There were three of them and they climbed a new route of course. So the writer (Raško), who was the third on the rope, behind a less experienced friend, almost got killed by a falling rock which was accidentally displaced by his friend above and kicked him in the head. He was bleeding badly. Joža Čop was the first on the rope and by some miracle, he managed to keep the balance while the other two were hanging on the rope below. Eventually, they got to the solid rock and to the safety again. I read the book during my student days, and I read it again four times later. So you might realize how special this mountain must have been for me, and it was really time for me to finally go there. So I was there in May last year, and of course, the mountain was under the deep snow, you can read a bit more about this here. 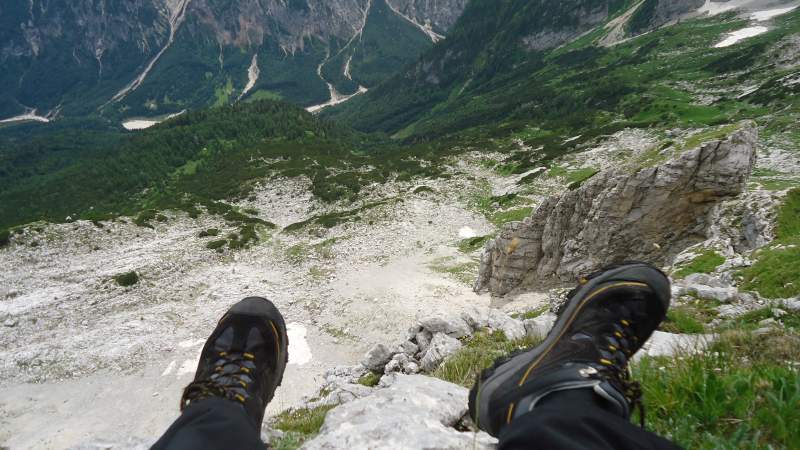 Then in July this year, I was there again and walked from the Soca river source all the way to Zavetiste Pod Spickom (hut), and then continued up to the Veliki Ozebnik mountain where the route goes before getting to the Jalovec final part. But eventually, I had to give up, it was raining and some sections were still under the snow. This time I was there at the beginning of September, and I was waiting for the best possible weather conditions, and I was lucky. This is why I am able to add this report here. Jalovec – view from the summit of Mangart from my earlier climb. You have seen my reasons, but why should you climb this mountain? In short, when you see it you will know why. 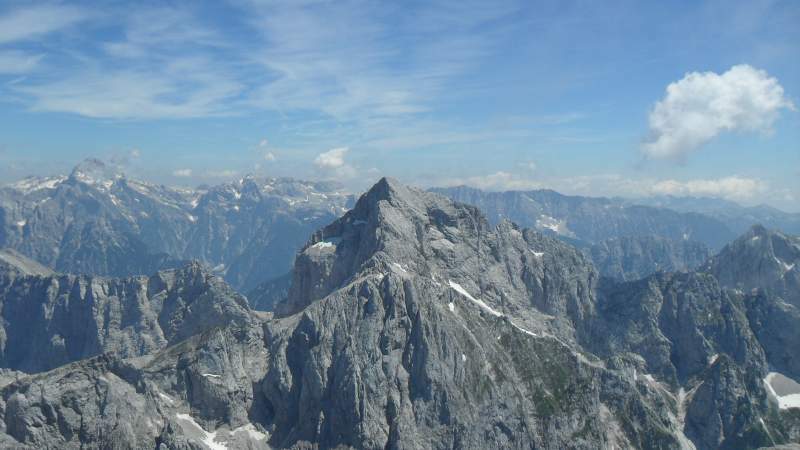 But without being cryptic, this is a spectacular mountain and there are no easy routes there. All of them are ferratas and without such iron stuff in the rock, you would only be able to enjoy its beauty from the surrounding valleys, unless you are a professional alpinist of course. It does not matter from which side you look at it, this mountain looks great from every angle, a pure beauty. You can see it here from the summit of Mangart, and here from my tour to Prisojnik. Because of the fixed iron elements in the most demanding sections, this mountain is accessible if you have some experience with the ferrata equipment. But it is still far from easy and the feeling of accomplishment will be there when you get back to safety. It can be climbed in one day, my friends Martin and Olga did it that way and me too, but you can also stay the night at the Zavetiste pod Spickom and make this a two-day tour. Elevation: 2645 m (8678 ft). Regarding accommodation and maps, check my page about the Vrsic Pass. My tours were from the south side, and I have passed all the approach routes there and this is why I am able to write about them here. My friends Martin Olsen and Olga Simon were kind to add their own story, they also climbed the mountain from the Vrsic Pass, so if I miss some important detail, you will find more in their text here so please have a look. The route from Vrsic – this is the blue line (the number 1) on the map below. The altitude difference is around 1030 meters but there are many up and down sections through the forest so better add at least 200 meters here. 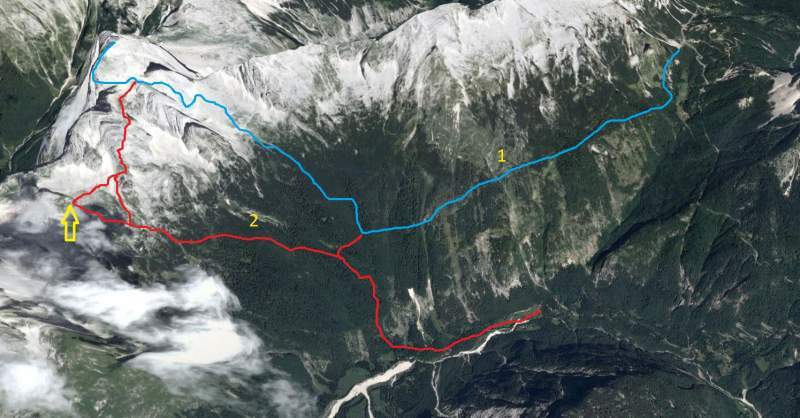 The route from the Soca river source – the red line and number 2 on the map. The altitude difference is around 1800 meters! The latter is much more demanding because of the huge elevation difference as compared to the Vrsic route where you start at 1611 meters above the sea. The picture below roughly shows the general directions. The two main south routes. The yellow arrow shows the position of the Zavetiste pod Spickom (the hut). When you drive in the south direction from Vrsic, you will see on the right the sign for the Soca river source and the corresponding hut. The hut looks like an ordinary restaurant, but it is indeed a true mountain hut. 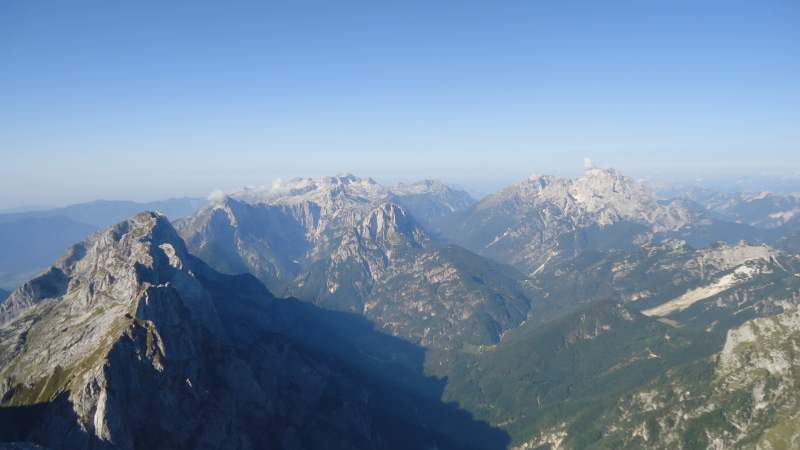 You can get there also from the Bovec side. 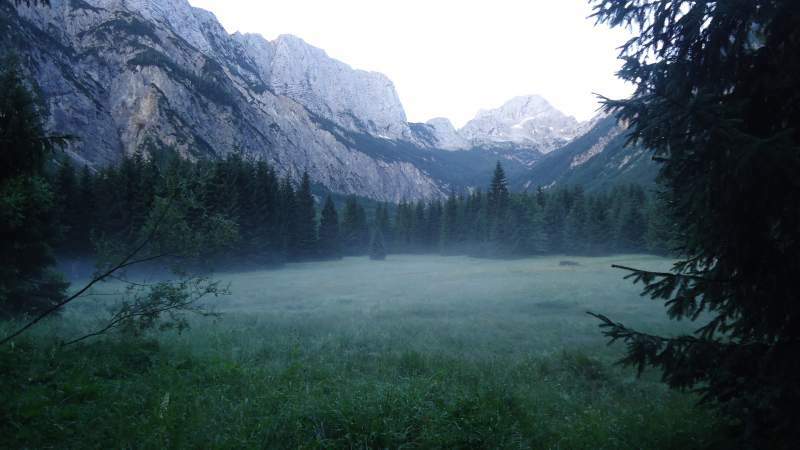 This is the beginning of the route from the Zadnja Trenta Valley, near the Soca river source, in an early morning. Bavski Grintavec mountain behind. So from here, there is a narrow road along the Zadnja Trenta valley. There are two parking areas, so I parked at the first and later realized there was yet another one very close to the true beginning of the route. Here, you are at some 800 meters above sea level. There are signs that show where to go, you will easily see them even if you come at early hours in the morning when it will be dark here. This is a very steep but pleasant walking route through the forest (see the picture), it zigzags all the time and you will gain the altitude by every step, literally. This is a part through the forest, very steep but pleasant. So at one point in the forest the route splits and you can go to the right and join the blue (number 1) route coming from Vrsic, or just continue up towards Zavestiste pod Spickom hut (see it in the picture). This is shown on the map above. This is the hut seen from the beginning of the section on Veliki Ozebnik. 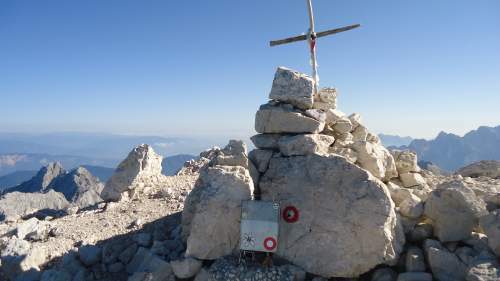 At some 30 minutes before the hut, you can turn right and start climbing the slopes of Veliki Ozebnik, the route to Jalovec goes along its east side, or you can continue towards the hut and then continue up again over Veliki Ozebnik peak. This split point is also shown in the map, just follow the red line. You are above the tree line here and the hut is visible above you. 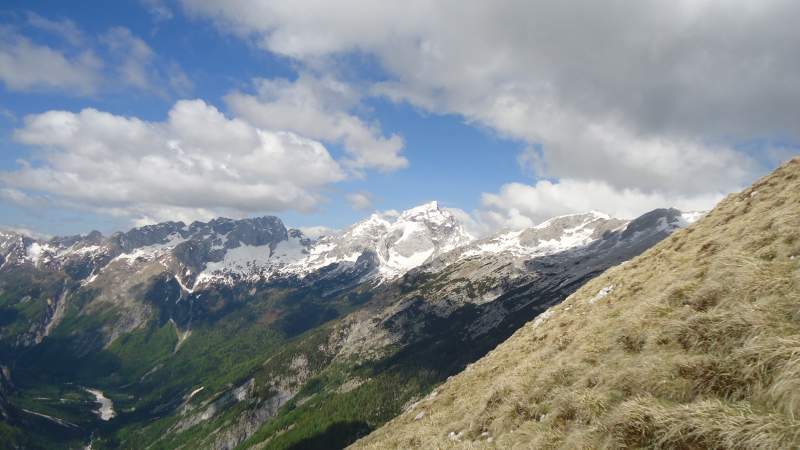 From the bottom of the valley to Zavetiste (this word means ‘hut’ in Slovenian) you will need up to 4 hours. If you continue to Jalovec, you will need another 2:30 – 3 hours. Far below is the Soca source hut where the route starts. 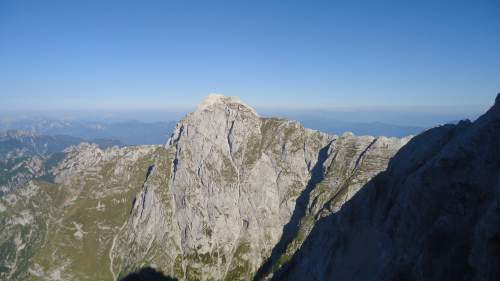 The photo was taken from the route that goes over Veliki Ozebnik, above the Zavetiste pod Spickom. 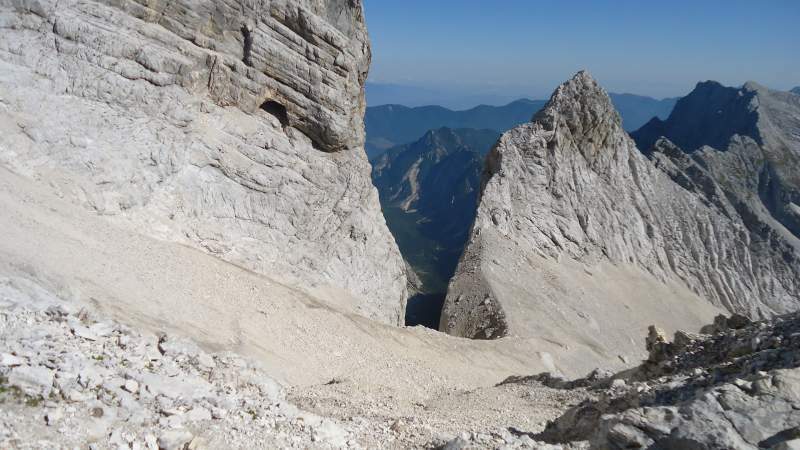 The section along Veliki Ozebnik slope above the hut is a scramble with exposed passages, with bolts and cables, far from trivial, if you have problems with vertigo better not go. Much higher you get to a plateau area where this route joins the blue route coming from Vrsic (and also the route from Tamar). 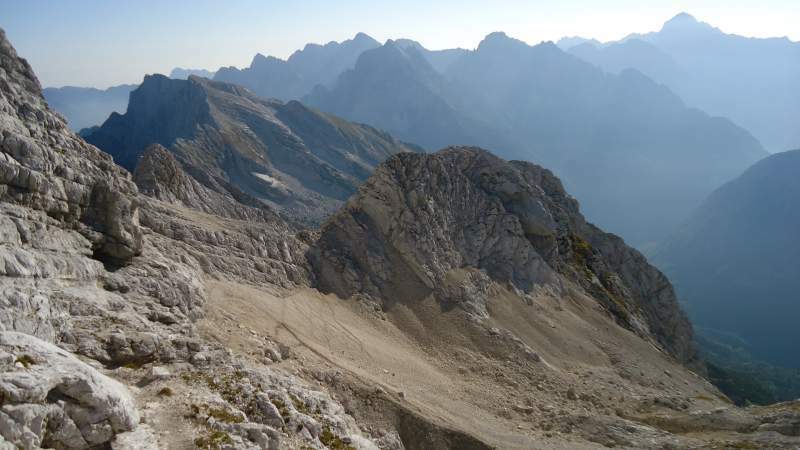 From this point, you have to make the final push to the summit (more below in the part about the Vrsic Pass route). In my case, it was raining, so I took a shelter at the hut for almost two hours. The couple at the hut told me this was their first day as guardians, and I was their first customer. This was also the first day for the hut in that season (and this was July). I asked why and they said everything was under snow until recently. They still did not have any food even for themselves, the supply helicopter did not come as planned. But the woman prepared me a tea. They also found a big conserved jar with cucumbers left from the last year’s guardian, and those were excellent. This reminded me about a similar scene from the movie Pianist, I hope you watched it. Later it looked as if the weather would improve, so I continued. 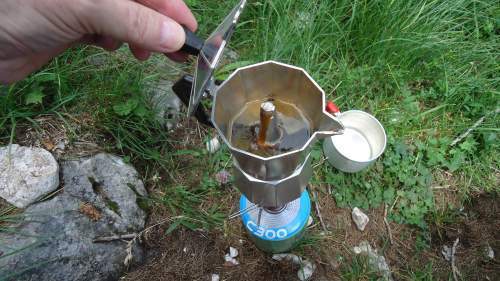 But when I was on Veliki Ozebnik route in the rock with cables, it started raining again. So after some 40 minutes above the hut, I had to give up. Going to such sharp peaks with the danger of lightning is simply not reasonable. This may be a bit easier route because of the elevation difference which is 1034 meters, but this is a rather long approach with many points where you descend and then climb up only to descend again, etc. This will be annoying on your way back when you have to pass it again dead tired if you do the tour in one day as I did. But here too you will walk for several hours through a very pleasant forest, there are some nice photos in my text about Zavetiste pod Spickom, and also the text by Martin and Olga, so have a look. 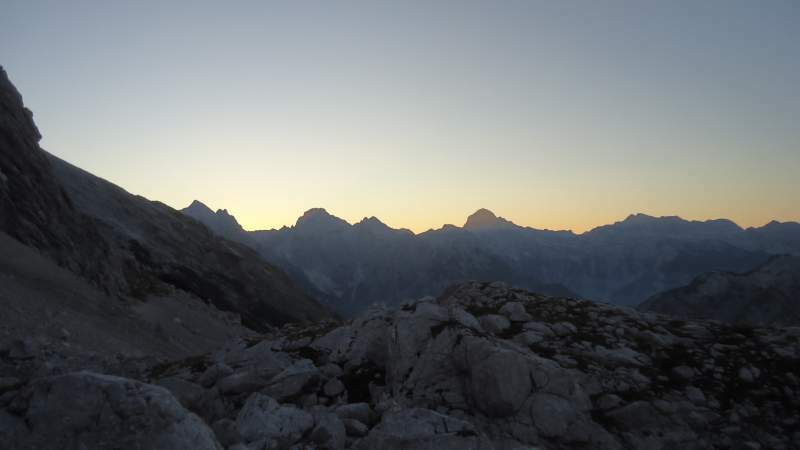 After several hours of walking – sunrise and the silhouette of Triglav in the distance. I started the tour at 3:50 am and I was on the summit a few minutes before 10 am, in total some 6 hours. So my timing was reasonable, I did not push too much and frankly, I would not be able to. It was several hours in the dark walking through the forest and with some ibex males making lots of the noise high above on the slopes of Travnik. 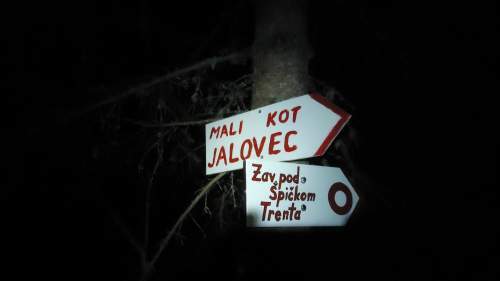 At 5:30 I was at the point where the route splits, so there is the sign to Mali Kot and Jalovec for the route that goes to the right and up the mountain, and yet another towards Zavetiste. So here take the route to the right, see the picture. But you can still continue to Zavetiste and then switch to the route 2 if you wish. Here take the direction to Jalovec unless you want to switch to the route 2. This is much higher at the sunrise, here comes the route from Tamar so the two routes join. Follow the Jalovec direction. But if you come from the Soca valley following the route 2 (after the first red line split, see the map above) and want to switch to the route 1, this would be the place to follow the sign to Jalovec (the Jalovska Skrbina route). 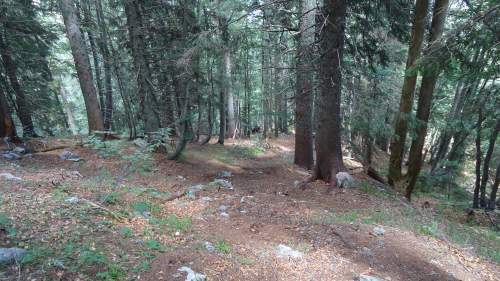 From here, the route is much steeper and still through the forest and eventually, you will be above the three lines and have some great views. Higher up you will get to the rock with the signs shown in the picture above, this is the connection to the route which later descends to Tamar. 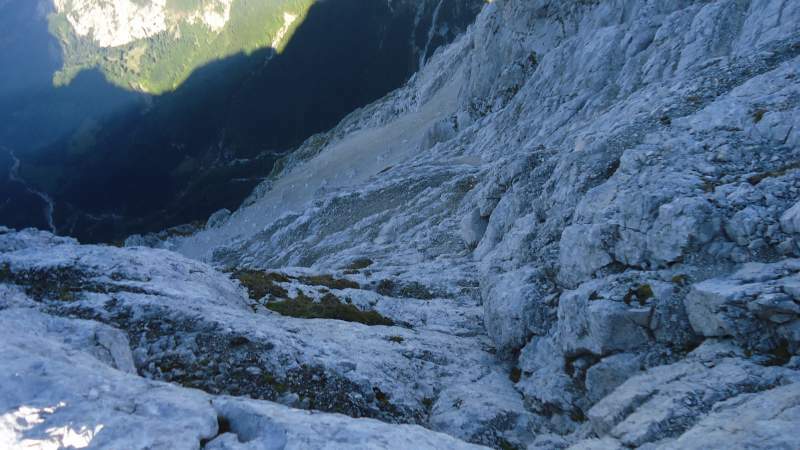 So here follow the direction to Jalovec, very soon you will get to the steep wall where the first long ferrata starts. There are some nice details and photos in the text of Martin and Olga, they call this section simply The Wall and will all good reasons, see the picture below. Those who were putting the ferrata elements there were a bit economical with steel cables. The wall is steep and no doubt you would need more cables, yet as I remember there are only three. But you have pegs instead, plenty of them, and you would not manage without them. This is the wall – the hardest part. The summit is well behind, not visible. The photo was taken descending the mountain with clouds coming already. If you are with a partner, then it is best to use a piece of rope here and secure each other, you will feel safer. But indeed it is doable without it. Below the wall at the sunrise, still did not know where exactly the route goes. In the wall, exposed sections all the time. Almost at the end of The Wall section and the first view of the summit. The route goes up and then to the left towards the pass (not visible). After that follows a mild area with lots of scree before you get to the pass. You will pass this incredible Ozebnik couloir (not to be mixed with Veliki Ozebnik peak mentioned elsewhere in the text) which is like a window towards the Tamar Valley below, see the picture. You continue in the west direction along the scree slope towards the pass above, then descend to the point where the route from Zavetiste joins this route, this is a few meters below the pass, on the other side of it. View from the pass through Ozebnik couloir, and Tamar valley behind. There is a route through this narrow couloir but it is officially closed due to falling rocks. From that point, the final ridge section looks hopelessly steep but as always once you get in it, you realize there are plenty of safe natural passages. But there are a few cables there as well and pegs before the final long summit ridge which is the most pleasant part of the climb. View towards the pass which is on the left-middle part of the picture, from the final summit slope. 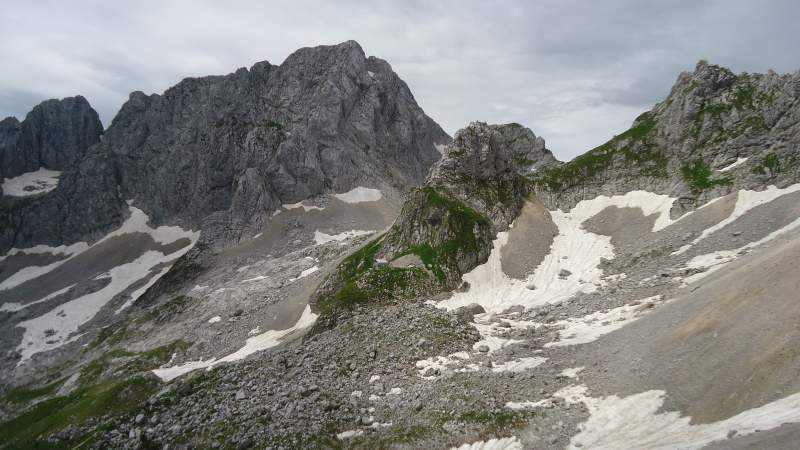 The place where the route from Zavetiste joins this route is visible, this is the scree area below. 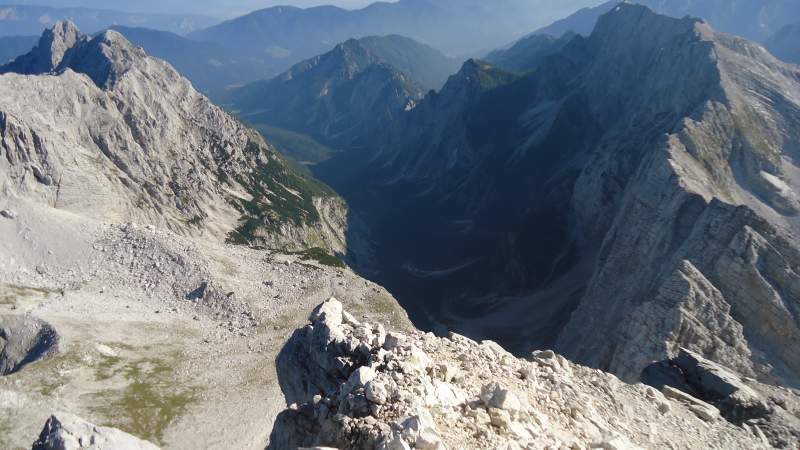 There are exposed passages on the summit ridge, the Koritnica valley looks endlessly deep below. In fact, you have some 2 kilometers difference from the valley floor to the summit, so imagine how it may look from the valley. 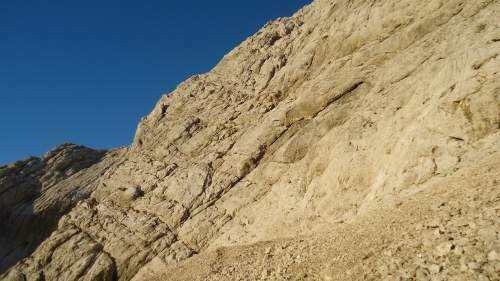 View back along the summit ridge with many exposed sections. The north-west wall above Koritnica valley, two kilometers of height difference here. There was nobody around, the weather was simply perfect and I have spent some 45 minutes or so on the summit, had a breakfast and took some selfies. This was a chance to bring back the lines from the book mentioned above, about the heights and silence. This is how I wanted it to be, to enjoy the mountain in its full beauty. Since English is not my native language, I cannot elaborate more about the feelings. I had been waiting several decades for those moments on the summit, so imagine. 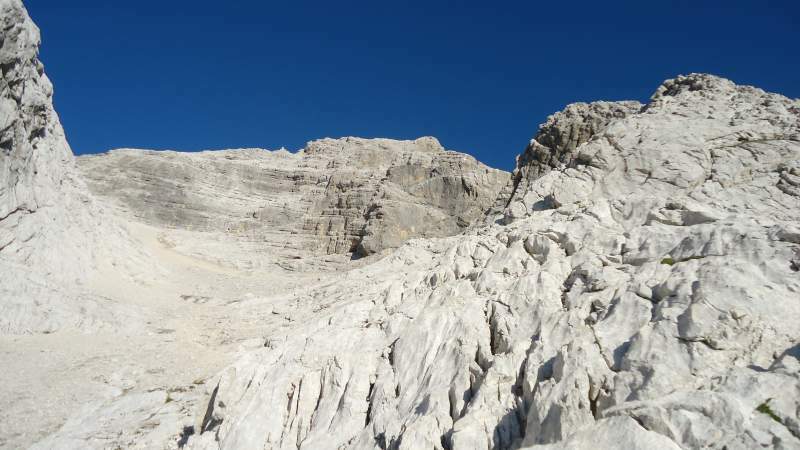 The route to Zavetiste goes roughly through the middle left section of this Veliki Ozebnik peak, with many exposed passages. 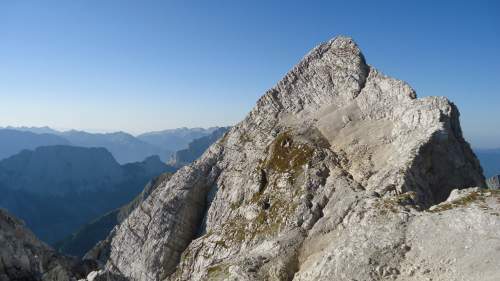 Mangart seen from Jalovec summit ridge. Those cliffs are 2 kilometers high. 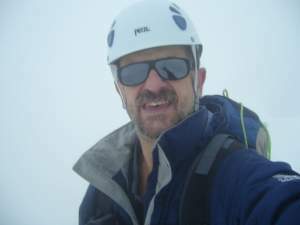 A selfie from the summit. The modest summit cross and the box with the stamp for those who collect them. 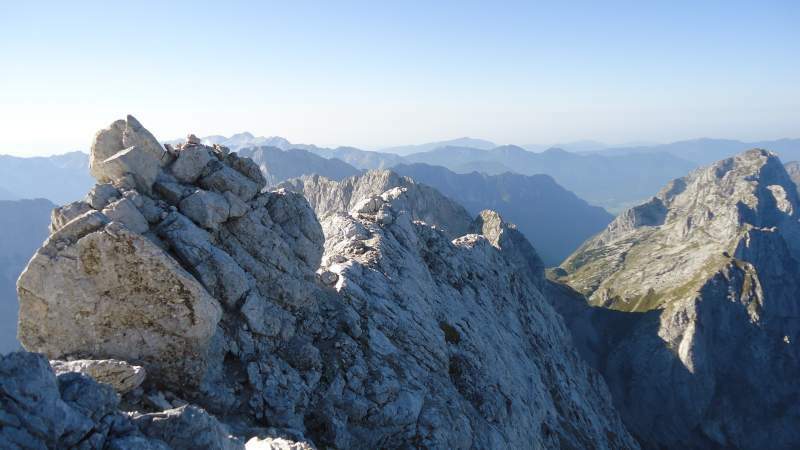 When I was back in the middle of the summit ridge, I met one Slovenian woman who climbed solo. After that, there was a Slovenian couple who came from the Soca valley route, and nobody else, surprising in view of such gorgeous weather conditions. Tamar valley as seen from the summit, and Mojstrovka-Travnik group on the right. Kanin (Canin) in the distance as seen from the summit of Jalovec. When I was on the road driving towards Bovec, I couldn’t see the mountain any longer, it was completely in clouds and it was raining there. So again, my timing was perfect for that day in the Alps, more one could not expect. 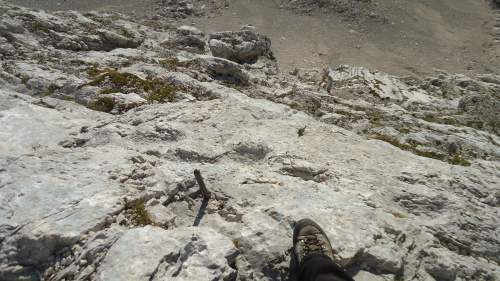 In one of the picture above you can see that I was using low-cut hiking shoes on my previous tour from the Soca valley. I did it because of the long walk through the forest and thought it would be good enough, but this was a bad idea. In the second attempt, I had my old hard high-cut Meindl boots. This is a proper footwear for such an environment. So check the page with boots if you want to find something for you. I was using my ferrata equipment (a harness and a Y-rope), I have one of the Black Diamond harnesses. Did not carry an axe, so late in the season there is no snow on the mountain. But if you are there in July, make sure you carry your ice axe with you, it might be necessary and the devil never sleeps as we say in my native language. It is advisable to have a helmet, I have my old Petzl and you can see it in my selfie above, check some great models here if you need one. You will need a daypack, so here is my list with some top models, and some women-specific packs are given here. As usual, I was using trekking poles, currently I have a pair of Komperdell poles, very lightweight and reliable. Make sure that your pack has loops to attach the poles because you need your hands free in those ferrata sections. As for the water, there are no sources around. In early season you might find it below on the route through the forest, there is a picture of it in my Zavetiste pod Spickom text. But this time it was completely dry. So carry the water with you. You can have it at Zavetiste, as well as a proper meal, but this is a long tour and you will have to carry lots of it in the pack. 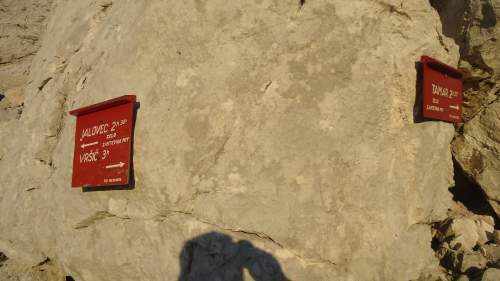 You might want also to read my report from climbing Krn in the same area. But how about you? 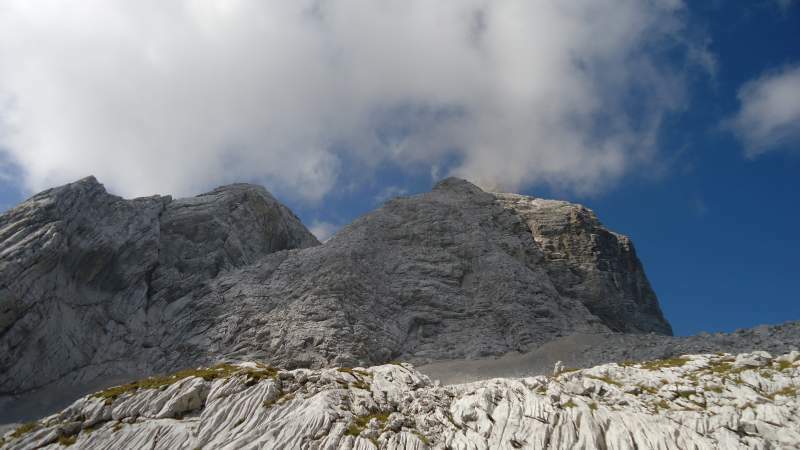 Have you climbed Jalovec, or just tried? Please let us know, share your thoughts here, there is a comment box below.